Warning concerning the group "import paths"
The scripts of the group "import Paths" are still in an experimental stage and do not always give the expected results. The word "Path" has not been chosen at random, that's really the only thing that is managed within the limits of the technical abilities of the Bézier's curves managed by Blender. 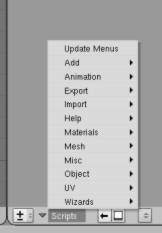 This source file, wich is located in .Blender/scripts directory, can cause a misunderstanding. If you try to launch it the usual way, that is to say "loading it in the text window" and doing "alt-p", you will obtain an error signaling that the variable "fonctionSELECT" can not be found. And indeed, this variable is located into the modules "svg2obj.py, ai2obj.py, eps2obj.py", thus gimp2obj.py and paths_import.py are only used to call them according to the user choice. 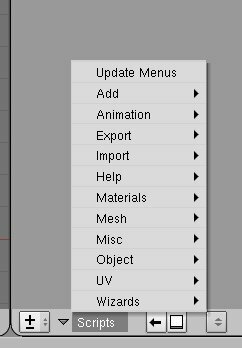 To do so, you have to go through the sub-menu Scripts/Import/Paths that you can find in the scripts window. must be interpreted as a layout for a menu's hierarchy. Name, Blender, Group and Tip are obligatory. 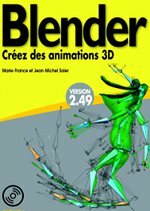 Text must be between single bracket except for Blender. The text that follows Name will be displayed in the menu but do not have to be entered in a particular shape. 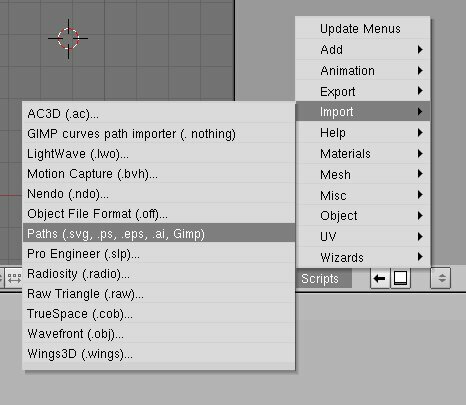 The version number prevents blender from displaying the script name in another version than the one indicated. The type that follows Group must exist into the corresponding version . In case of doubt, take 'Misc' but avoid 'Help' which make appear this entry in the 'Help' menu only not in the 'Scripts' menu . Submenu is optional and must be followed by a first free text that will appear within the menu and a second one that will be given to the script as if it was an argument in command line (look at the python documentation concerning the sys module and the argv property). As it is indicated above, the modified script must be saved in the .blender/scripts directory . Giving an argument to the "paths_import" script.